Those who know me know that over the years, I’ve transitioned to non-toxic home and body care products. I make my own deodorant and toothpaste, I wash my hair with baking soda and apple cider vinegar, and I moisturize with natural oils. I clean most of my home with baking soda, vinegar, and elbow grease. One thing that took longer to change up was makeup. Yes, the best thing to do would be to give up makeup entirely. I am not a high-maintenance girl, and I wish I could do that; but man, I have the worst skin. I have had terrible acne since I was 11 and it is not letting up at all in my thirties. I . . . I don’t want to talk about it. It really bums me out. Suffice it to say, I’m really self-conscious about my skin and I feel better with a bit of makeup. I tried a few commercial brands of less-toxic makeup, but they were very expensive, the ingredients were still kind of sketchy, and they didn’t work as well. Making my own makeup just seemed too hard. How would I get the right shade for my skin? How could I get homemade mascara to not run? The first thing I changed in my makeup kit was my eyeliner. I started making my own eyeliner out of activated charcoal. That was super-easy and inexpensive, and also really effective. I live in a small Canadian town, so I don’t have access to a lot of local shops making small batches of homemade lotions and makeup. And shipping is bonkers expensive here. Buying makeup online is risky because you can’t test it out. What’s a girl to do? Finally, a few years ago, I got a chance to try mineral makeup, which I’d been wanting to try for years. Mineral makeup uses minerals such as iron oxides, talc, zinc oxide, and titanium dioxide, which are ground and milled into tiny particles to create makeup. It sits on the skin rather than being absorbed into it, making it safer. It’s free of parabens, chemical dyes, and perfumes, and are healthy for all skin types. Many brands even claim to nourish the skin rather than damage it. But real mineral makeup always comes in a loose powdered form. One of the main reasons is because the ingredients that turn makeup into a liquid are generally the most toxic ones. Basically, you need harsh ingredients to create a liquid makeup that won’t go bad. Microbes thrive in water, so liquid formulations must include some kind of preservative. If you don’t want nasty preservatives in your makeup, you can’t have it in a liquid form. So I gave powdered mineral makeup a good try. I watched all the YouTube videos on how to apply it and bought the fancy kabuki brush. I couldn’t get it to work for me. Like I said, I have really crappy skin: I have constant acne, and it’s always simultaneously dry, too. Powder always looks cakey on me, and it takes a ton of it to cover all my blemishes. Mineral makeup is expensive. And I’m lazy. I can’t be brushing powder all over my face for ten minutes every day. I wanted the natural-ness of mineral makeup, but the creamy texture of my favourite CoverGirl liquid powder foundation. But none of the toxic ingredients necessary for a commercial liquid makeup. 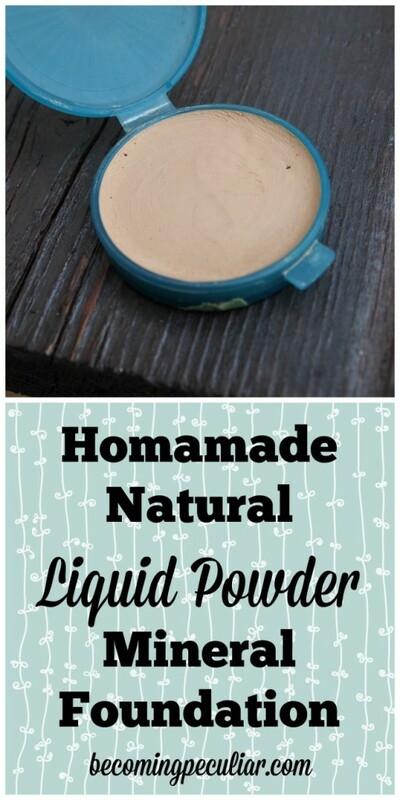 It was time to turn my powdered mineral makeup into a DIY liquid foundation. I realized that if I wanted to make my own liquid makeup, I would need to make it in small batches to prevent contamination and growth of microbes. And if I needed to make it frequently, the recipe needed a minimum of ingredients to make it quick and easy. One DIY recipe I came across online demands that you make a small batch every single day to prevent the growth of mould. Sheesh! I’m not that concerned about contamination. So I make a batch that lasts me about a month. I figure that most makeup you pick up from the drugstore shelf is probably already a month old by the time it gets into your shopping cart, so I’m at least doing better than that. That same recipe claims to have only “two ingredients,” but one of the ingredients is a homemade lotion consisting of five other ingredients. So . . . no thanks. I wanted something quicker and easier. After experimenting with a few different natural oils and butters, and playing with the proportions, I found one that made me happy. Just plain shea butter was too thick and pastey, so I added skin-friendly jojoba oil to thin it and add some slip. You may want to play around with it, too, in order to control the amount of coverage it offers and how thick you like it. Okay, so now you’re wondering, Does it work? How does it look? This creates a thick, creamy foundation similar to CoverGirl’s Ultimate Finish Liquid Powder. It’s not pourable at room temperature. It can also work as a concealer. *I buy mine from a small store in London, Ontario. I’ve heard good things about Jane Iredale and Bare Minerals, available at Sephora. I’ve also purchased a decent mineral makeup from the Body Shop. Place three ingredients in double boiler, and warm just until shea butter is melted. Then stir well. Scrape it into a small container and allow it to cool. Apply to skin using a good-quality makeup sponge. That’s it! I make a batch about every 6 weeks, but then, as a stay-at-home mom I rarely apply it. I love this!! Could you tell me about how long it lasts? I love mineral makeup but I work very long days (10+ hours) and I feel like my makeup only makes it about halfway thru the day. So I’m curious about the staying power since it’s now a cream/liquid consistency. I would think this would last quite a while; as long as you get the actual product out with something very clean. Jojoba has a very long shelf life (infinity? ); and shea butter lasts a while when blended with other longer life oils. There is no liquid in there to encourage microbes. I make this type of foundation myself; and I thin it out a bit with oils (I love organic unrefined sunflower oil; with a little Rosehip seed oil) and keep it in a 1 oz. apothecary bottle (and herb bottle with a regular cap). I have had mine for months and so far no problems at all. I will put in some corrector to cover up some redness (I use a yellow/gold pure mineral corrector) and use it as an all purpose BB cream, foundation and primer if I am going to use more makeup over it. Hope this helps! Oh… and for me it lasts almost all day. This is great, thank you. I already mix different types of medicinal clay powder to make something similar to a mineral makeup powder, it’s easy and fun to mix it to get the right shade, even if the powder is not as thin as industrial ones. I have the same problem as you, also in my 30s and I pick my face way too much! Thank you so much for this post!! I was totally unaware of mineral make-up and thought it was just expensive cosmetics forever because I am too lazy to do research. Plus, I am scared because I like you have clung to Cover Girl because I live in a rural area with like no resources lol. Your pictures look great and I throughly appreciate it. Just an idea for you. I used to have horrible acne and then found out about progesterone role in hormone balance. I started using pro max 5% cream and my skin is flawless now. Just an FYI if you’re interested. 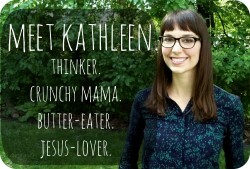 Thank you for this lovely DIY tips Kathleen. I am a mineral makeup lover! Since I started using mineral makeup about 8 years ago. Mineral makeup is really easy to use, once you get the hang of it. It can take a few tries before you finally learn that it is completely different from traditional makeup, and so is applying it. 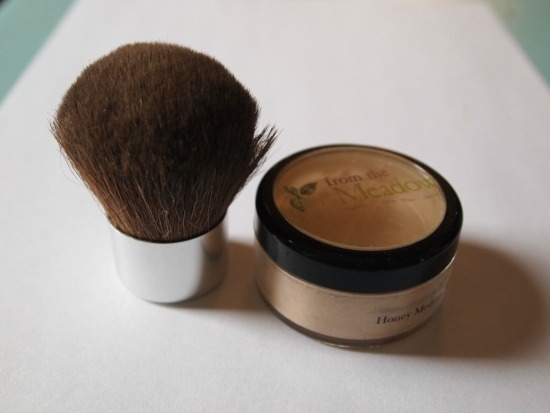 You simply use a brush the way you would with loose powder, swirl, tap buff, it really is that easy. My favorite part is that the makeup works with the oils in your skin and melts into your face, making it even more natural looking. You can also change the amount of coverage you want with mineral makeup. Apply one coat, if it isn’t enough add more, mineral makeup is completely build-able. Amazing post! I love DIYs. 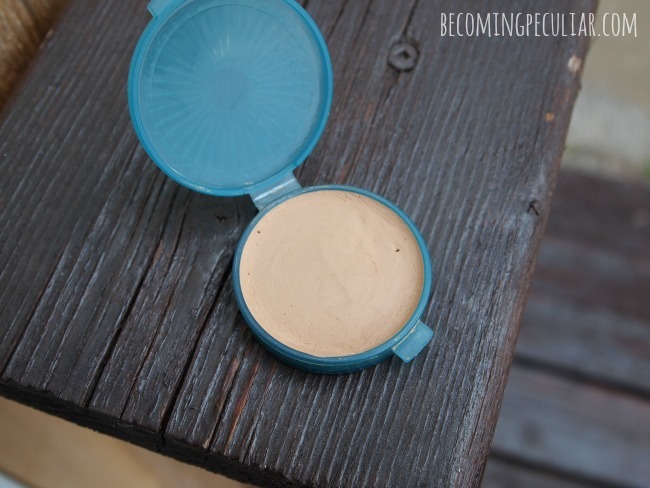 Thank you for sharing this DIY make up foundation with us. I can’t believe that something like a liquid foundation is possible to make just by using three simple ingredients. You are talented and artistic to come up with this idea. I love the pictures too. It just showed that the liquid foundation is really nice when applied to facial skin. Natural product is the best! 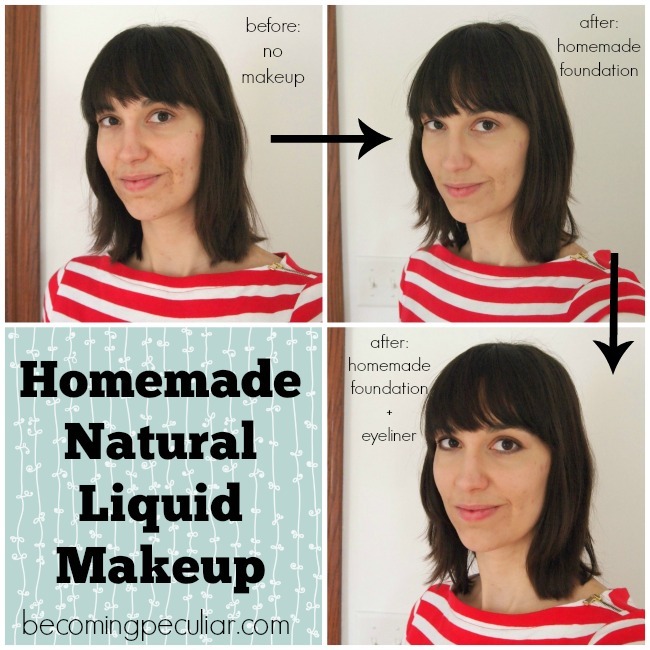 Have you tried making other DIY natural make ups?